Motivation for learning a second language varies among individuals: some people enjoy the process of learning languages, while others learn a second language for practical reasons. Previous fieldwork research in Thailand has shown that many consumers of Japanese cultural products are also learners of the Japanese language. This suggests that Japanese cultural products motivate consumers to start studying Japanese and to continue learning it. In this study, two hypotheses will be posed in order to reveal the relationship between the consumption of Japanese cultural products and Japanese language learning: (1) exposure to Japanese cultural products induces Japanese language learning, and (2) Japanese language learning induces the consumption of other Japanese cultural products. Through questionnaire research conducted on university students in Thailand and through ethnographic data, this study attempts to examine the hypotheses and to demonstrate a continuous cycle model of Japanese language learning and the consumption of Japanese cultural ­products. During the last few decades, Japanese pop culture has become very popular throughout the world, especially in Asian countries. Newsweek on November 8, 1999 reported that many characters from anime (Japanese animation) such as Pikachu (Pokémon), Hello Kitty, and Doraemon were consumed by the new generation of middle-class Asian consumers, and that X-Japan, Puffy, and other Japanese music icons as well as TV stars had attracted the younger Asian generation, which yearned for more Japanese pop culture (Koh 1999). Although commodified culture, which generally comprises a high proportion of native speakers, tends to flow between countries of the same language culture, Japanese is spoken only in Japan—and its commodified culture is formed mostly from the Japanese language. In order to consume Japanese cultural products, however, knowledge of the Japanese language is not necessary, since most of the products are translated and/or localized for consumption in each country and region of the world. In Thailand, manga (Japanese comics) are translated into Thai, and anime (Japanese animation) is subtitled or dubbed in Thai by Thai voice actors. Some Japanese fashion magazines are published in Thai, and readers can obtain up-to-date information about Japanese clothes, fashion, cosmetics, and accessories in their first language. Most of these products are readily available in Bangkok and are also sold in stores across Thailand. Although Japanese language ability is not absolutely necessary for the consumption or enjoyment of Japanese cultural products, it can be an advantage for consumers of them if they want to consume them enthusiastically and pleasurably. In a previous study, a questionnaire research on fans of the Japanese male idol group w-inds., which was conducted in Bangkok in 2007, revealed that 52.9 percent of respondents started studying the Japanese language after they became w-inds. fans (Toyoshima 2011, 122). Twenty-five percent of respondents had started learning Japanese before they became fans, and 18.3 percent said they wanted to learn Japanese, which means 97.1 percent of fans had experienced learning Japanese or were interested in doing so. They needed Japanese language ability to read the lyrics of the songs, to listen to the video interviews, to write fan letters, to read idol magazines, to read information on the Internet, and so on. In another study conducted in Bangkok, in October 2008, a questionnaire research on cosplayers—fans of the otaku subcultures of manga, anime, or video games who ­create costumes and props related to their favorite characters and wear them to conventions and expositions—revealed that 42.3 percent of respondents had studied Japanese in the past and 23.1 percent were currently studying Japanese (ibid., 180). Titles of several manga, anime, and video games are translated into Thai, but there are many more that have not been translated yet. If Thais want to consume such “untranslated” products, they need to study Japanese. The two above-cited questionnaire research surveys on Thai youths reveal that the consumption of Japanese cultural products is closely related to Japanese language learning. Based on the research results as well as interviews I have conducted in Thailand over the past several years, I realize that there is a relationship between the consumption of Japanese cultural products and language learning; these surmises can be summarized in the hypotheses in the following paragraph. First, exposure to Japanese cultural products induces Japanese language learning (Hypothesis 1). When one starts liking a Japanese cultural product and wants to consume it more seriously or deeply, one may start wanting to learn Japanese. Second, Japanese language learning induces the consumption of other Japanese cultural products (Hypo­thesis 2). When one studies Japanese, one may be exposed to additional Japanese cultural products, especially through interaction with other Japanese learners who are consumers of those products, and one may develop an interest in other Japanese cultural products. Lastly, if the first and second hypotheses are proved to be true, they can be combined to theorize a continuous cycle of language learning and consumption of ­Japanese cultural products (Fig. 1). This study seeks evidence to prove the two hypotheses, and it discusses the process of the continuous cycle as the driving force for the popularization of Japanese cultural products in Thailand. Through discussing and testing these hypotheses, I will try to answer two questions: Is the consumption of Japanese cultural products a motivation for starting to learn the Japanese language among Thais? And does Japanese language learning motivate language learners to consume more Japanese cultural products in Thailand? The discussions in the following sections are supported by three kinds of sources: (1) concepts from previous studies (literature review), (2) an overview of Japanese language education in Thailand, and (3) questionnaire research results. In the following sections, concepts in culture and media studies (“geolinguistic region,” “cultural discount,” and “cultural odorlessness”) will be introduced, and then language acquisition will be presented. Following the literature review, there is a brief explanation of the Japanese language education system in Thailand. After that, I present the results of a questionnaire survey on university students majoring in Japanese in Thailand. Lastly, the discussion and conclusion are presented. 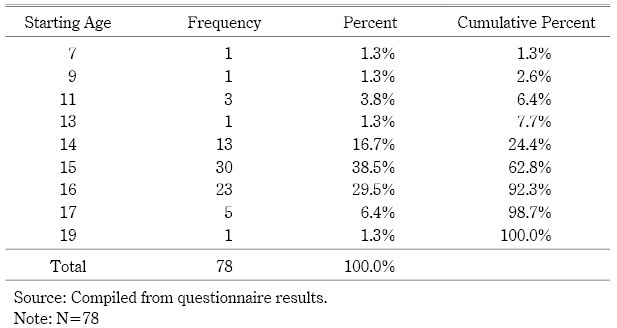 In this study, a questionnaire was administered to 78 Japanese major students in Chulalongkorn University (Table 1) between October and December 2008. The questionnaire forms were distributed in classrooms by a professor in the Japanese language department. Most of the respondents were in their third or fourth year of studies at the university, but there were a few first- and second-year students among the respondents. The questionnaire was qualitative in nature, as many of the questions were open-ended and the students could write freely in the space provided. In addition to the open-ended questions, the questionnaire included “Yes/No” questions and “fill-in number” questions that could be analyzed statistically. The reason I embedded the latter questions in the questionnaire was that such questions can provide basic descriptive data on the respon­d­ents—and because they are simple and easy for students to answer instinctively. 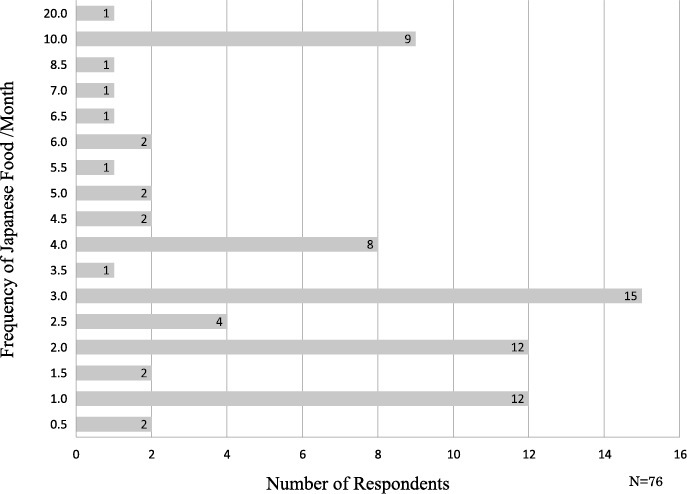 It is important to note that the questionnaire results in this research are mostly descriptive; and they are used to complement the qualitative analyses. What is important for this research is to show as many opinions and comments from the respondents as possible, thus demonstrating with empirical data the relationship between Japanese language learning and the consumption of Japanese cultural products. In discourses on audiovisual cultural products or “media products” such as films and television programs, some cultural and media scholars have used the term “geolinguistic region,” which means “all the countries throughout the world in which the same language is spoken.” According to these scholars, media products in a certain language can be marketed more easily in countries that belong to the same geolinguistic region (Sinclair 1996, 42). A good example is the English-speaking world: producers in the United States are able to spend expensive budgets on the production of media products, as they can expect greater returns on their products by taking advantage of the expansive English-speaking markets of the world. Richard Collins points to “the language advantage” that Anglophone producers have: English is not only the language with the largest population of native speakers, it is also the world’s most important second language (Collins 1990, 54–55). In discussions on the international trade of television programs, the term “cultural discount” is used to express a reduction in appreciation of the value of a television program in the recipient country. When a foreign program is broadcast, the value of the program is diminished and fewer viewers will watch the program than a domestic program of the same type and quality (Hoskins and Mirus 1988, 500; Lee 2006). In the notion of cultural discount, the factor of how closely viewers can identify with the culture in the content of programs is very important. Although language can be translated or dubbed by local voice actors, the culture of the country of origin remains in the content. Colin Hoskins and Rolf Mirus point out that Japan has been successful in exporting VCRs to the American market, but it has not been successful in exporting television programs to the American market. They explain that “a VCR is culturally neutral, an American or German is indifferent to the country of origin of a VCR unit because this does not affect the way it works and the satisfaction he obtains from usage” (Hoskins and Mirus 1988, 503). The notion of cultural discount is not in line with the worldwide success of anime and Japanese video games. Koichi Iwabuchi argues that the notion of cultural discount does not explain a consumer’s cultural preference and that the concept of “cultural ­neutrality” is misleading (Iwabuchi 2002, 27). Iwabuchi uses the term “cultural odor” to mean the symbolic image of the country of origin of cultural products; and he finds the “cultural odorlessness” of Japanese video games and anime to be one of the reasons for their popularity throughout the world. The concept of cultural “odorlessness” thus denies “Japaneseness” as the reason why Japanese cultural products are so popular throughout the world. When we apply these notions of media studies to Japanese cultural products that are not “culturally neutral” but are “culturally very Japanese,” it can be predicted that there is likely to be a depreciation in value of such cultural products in the Thai market. Researchers in social psychology and education have been discussing the importance of motivation for second language acquisition for several decades (Gardner and Lambert 1972; Clément and Kruidenier 1983; Noels et al. 2000). One of the first—and important—theoretical discussions on the issue was by Richard Gardner and Wallace Lambert, who suggested that a student’s motivation to learn a second language was determined by the student’s attitude toward the linguistic-cultural group in particular, by the student’s attitude toward foreign people in general, and by the student’s orientation toward the learning task itself. They identified two classes of orientation. The first is instrumental, which refers to a desire to learn the second language to achieve some practical goal, such as job advancement or course credit. The second orientation is integrative—that is, the student wishes to acquire the second language in order to learn more about the other cultural community (Gardner and Lambert 1972, 3; Noels et al. 2000). By applying the notions of instrumental and integrative orientation, Natnicha Vadhannapanich analyzed the motivations of 40 Japanese language learners in Thailand—language learners she had recruited through the Internet and who had been studying Japanese for more than five years (Natnicha 2010). She found that 36 of the 40 language learners had started to study Japanese in order to obtain information about Japanese pop culture (instrumentality) and that learning Japanese made the language learners foster and nurture a love for Japan (integrativeness) (ibid.). Although the notion of instrumental and integrative orientation in discourses of second language motivation seems useful in classifying each individual motivation, it seems oversimplistic to label a language learner with the dichotomic orientational types. According to the Survey Report on Japanese-Language Education Abroad 2006, approximately 2.98 million students were studying Japanese in 133 countries outside Japan in 2006 (Japan Foundation 2008a). Thailand is one of the 133 countries that offer Japanese language education. As shown in Table 2, the number of Japanese language learners in Thailand is the seventh largest among the 133 countries. The Japan Foundation conducts a survey on Japanese language education abroad every three years. Table 2 is based on the results of its 2006 survey, which indicates that the number of Japanese learners in primary and secondary schools in Thailand increased by 80.9 percent in 2006 compared to 2003. As shown in Table 3, Japanese language education is highly prevalent in Thailand in proportion to the size of the population; there is one Japanese language learner for every 903 people. This figure is ranked 16th in the Top 30 list, which means that Japanese language education is very popular in Thailand. In 1980, Japanese was adopted as one of the foreign languages to be taught in secondary schools in Thailand (Matsui et al. 1999, 61). The Basic Education Core Curriculum B.E. 2551 (A.D. 2008) prescribes basic learning content for English, but “for other foreign languages, e.g., French, German, Chinese, Japanese, Arabic, Pali and languages of neighboring countries, it is left to the discretion of educational institutions to prepare courses and provide learning management as appropriate” (Thailand, Ministry of Education 2008). In reality, foreign languages other than English are taught in upper secondary schools in Thailand (Fig. 2): French, German, Spanish, Italian, Hindi, Pali, Japanese, Chinese, Korean, Vietnamese, Malay, and Arabic (Ebihara 2004). Source: Compiled from the figure in Education in Thailand 2004 (Thailand, Office of the Education Council, Ministry of Education 2004). In her report on the content of Japanese language education in upper secondary schools in Thailand, Fumiko Shiratori wrote that in 2001 there were about 2,400 public secondary schools in Thailand, of which about 120 taught Japanese. According to the report, although the guidelines for Japanese language instruction were issued by the Ministry of Education in Thailand, the content that was taught in schools was not stand­ardized and each teacher could choose what to teach (Shiratori 2002). When I visited the Ministry of Education in Thailand for an interview in 2007, ­Chantra Tantipong, who was an officer at the Bureau of Academic Affairs and Educational Standards, told me that the Japanese language curriculum for upper secondary schools was developed and maintained with the collaboration of the Japan Foundation (Personal communication, December 14, 2007). At the time of the interview, the Basic Education Curriculum B.E. 2544 (A.D. 2001) was in effect, but it also let each school decide what to teach and how to teach foreign languages besides English (Thailand, Ministry of Education 2001). The ministry, therefore, did not have any statistical data or information on Japanese language education in Thailand, and the Japan Foundation was the agency that developed the Japanese language education curriculum for secondary schools in Thailand. The Japan Foundation in Bangkok is the center of Japanese education in Thailand. It organizes several programs that contribute to Japanese education, such as holding seminars and training courses for teachers, providing teaching materials, dispatching Japanese education experts to educational institutions, executing the Japanese-Language Proficiency Test (JLPT), and so on. In an interview, Kazutoshi Hirano, the head of the Japanese language department of the Japan Foundation in Bangkok, explained the purpose of the Japan Foundation in regards to Japanese language education (Personal communication, April 2, 2008). Hirano’s detailed explanations on the projects clarified that the activities of the Japan Foundation greatly supported teachers and secondary schools. As Chantra Tantipong of the Ministry of Education suggested, Japanese language education in upper secondary schools in Thailand is supported by the activities and services of the Japan Foundation. The number of learners by type of education in ASEAN countries is shown in Table 4. In Thailand, 45 percent of Japanese language learners are in primary and secondary school. For secondary students in Thailand, there may be another incentive to study Japanese. Since 1998, the Japanese language has been one of the subjects in the standardized university entrance examination system in Thailand. Upper secondary school students who want to enter non-science major programs (departments) at university are usually required to take four subject examinations: Thai, social studies, English, and an elective. In the entrance examination, there are six foreign languages: French, German, Pali, Arabic, Chinese, and Japanese. Many non-science major students take a foreign language examination as an elective; in the entrance examination of 2004, there were 2,558 students who chose Japanese as an elective (Ebihara 2005). The curriculum for higher education is prepared by individual institutions. Teaching materials and methods are also developed by each individual university. 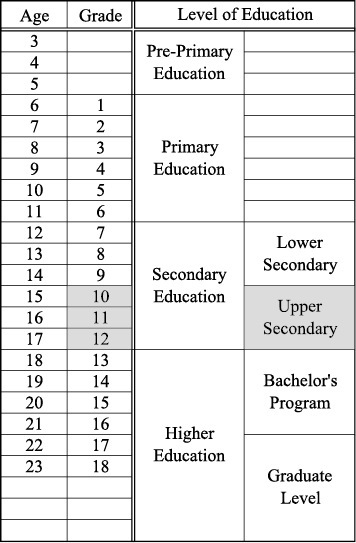 Although the Ministry of Education (Thailand) requires that each university revise its curriculum every five years and that the new curriculum go through an authorization process that has to be approved by the ministry, the current curriculum is not evaluated systematically to reflect on the new curriculum (Ek-Ariyasiri 2008). Before the mandated curriculum revisions, therefore, some university professors try to evaluate their own curriculum by comparing it and the results of their JLPT with other universities. 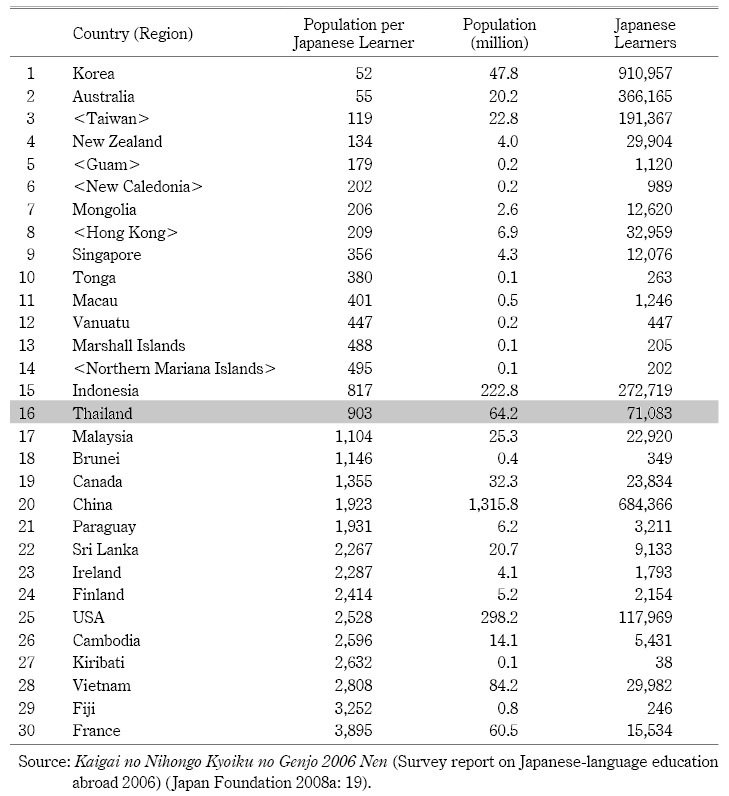 As can be seen in Table 4, 30 percent of Japanese language learners in Thailand are in higher educational institutions. This number includes students who major in Japanese language, as well as students who take Japanese as an elective course. As university curricula vary, it is not easy to grasp the overall picture of Japanese language education in higher education in Thailand. When university professors evaluate their curriculum, they sometimes use the JLPT as an index to decide the level of instruction. In the next section, therefore, I will review the results of the JLPT from the past few decades to reveal the trend of Japanese language learning in Thailand. The Japanese-Language Proficiency Test (JLPT) has been offered by the Japan Foundation and Japan Educational Exchanges and Services since 1984 to evaluate Japanese language aptitude among non-native speakers. In the previous version of the test, which was administered until 2009, there were four levels (l to 4); but a new test, which was introduced in 2010, offers five levels (N1 to N5, with level N3 having been added as a new level between levels 2 and 3 of the old test). In 2008, 449,810 examinees (total for all levels) sat the test in 144 cities, in 51 countries and regions. In Thailand there were four test sites: Bangkok, Chiang Mai, Songkla, and Khon Kaen; 15,846 examinees (total for all levels) sat the test (Japan Foundation 2009). The Japan Foundation publishes the number of applicants and examinees for each level by country every year, but the number of successful examinees from each country is not announced. For the purpose of this study, I use the total number of examinees of all levels in Thailand from the published data. 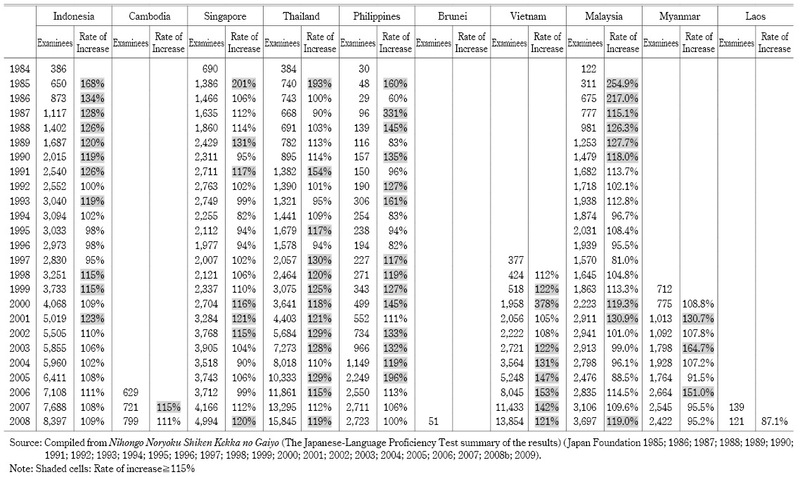 The number of JLPT examinees (and applications) in ASEAN countries from 1984 to 2008 is shown in Table 5. For the table, I calculated the rate of increase that compares the numbers with previous years in percentile. The cells in the table that indicate a rate of increase of more than 115 percent are shaded gray. Looking at the table, we can see that the rate of increase remains high (as shown by the shaded cells in the table) when the JLPT is first introduced in a country. In order to discern the trend in the popularity of Japanese language learning, I calculated the number of JLPT examinees per one million people in ASEAN countries (except Cambodia, Brunei, and Laos) and plotted this data on the semilog graph (Fig. 3) for every five years. If we look at the number of JLPT examinees adjusted by population in the ASEAN countries, Japanese language learning was most popular in Singapore—there were more than 877.2 Japanese language learners per one million people. Thailand was in second place, with 156.7 Japanese language learners per one million people in 2005. Note: Populations used in calculation were retrieved from World Population Prospects: The 2008 Revision, Vol. 2 (United Nations, DESA 2009). As we see in Table 5, Thailand has kept the rate of increase at a “high” percentage since the mid-1990s, which suggests that Japanese language learning has been popular since then. Fig. 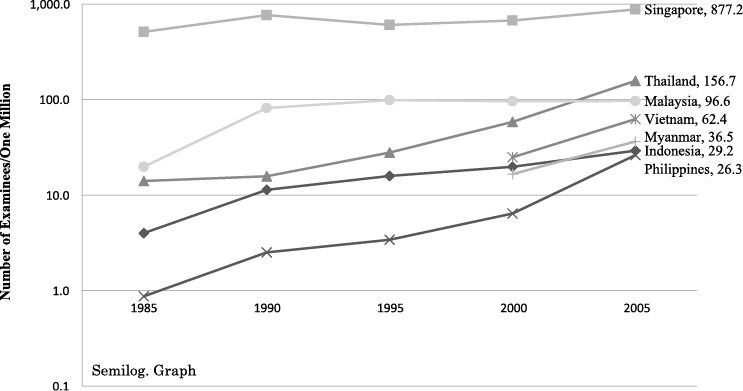 3 also suggests that the number of JLPT examinees increased in the 1990s in Thailand. In the 1990s, manga started to be published under the license of Japanese publishers; the import of Japanese TV programs and animation increased after the collapse of the bubble economy in Japan; and J-Rock and J-Pop became popular in Thailand as well as in other Asian countries. The increasing growth of Japanese language learning during the 1990s coincided with the influx of cultural products from Japan, which suggests that many Thai people were exposed to Japanese cultural products during the decade and many of them started learning Japanese. Furthermore, Fig. 3 indicates that the influence of the Japanese language in Thailand has become more marked after the year 2000. In 2004, a new textbook for teaching Japanese in secondary schools was published by the Japan Foundation. The title of the textbook was Akiko to Tomodachi. The textbook was a collaborative effort by university professors, secondary school teachers, experts in Japanese language education, and the Japan Foundation (Bussaba 2004). As we have seen in this study, the number of Japanese learners in Thailand increased especially after the 1990s, and the demand for Japanese language teachers also became very high. In order to provide quality Japanese language textbooks for secondary schools, therefore, a special textbook writing project was started at the Japan Foundation in February 2000. Since the textbooks contain explanations and instructions in Thai, especially in the introductory volumes, Thai students and teachers can fully understand each step before they proceed to the next level (Bussaba et al. 2005). In this section, I will briefly review the results of the questionnaire to demonstrate the relationship between Japanese language learning and Japanese cultural products. 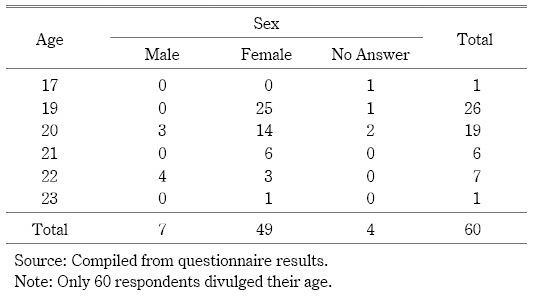 Let us start with Table 6, which shows the age respondents started to learn Japanese. As we can see, 15 years old is the mode; students who started to learn Japanese between the ages of 15 and 16 make up 68 percent of respondents. This suggests the students started learning Japanese when they were in upper secondary school. Most of the students started to learn Japanese before they entered university, and the average duration of Japanese language learning was 5.26 years (N=78) at the time the questionnaire survey was carried out. The survey results show that 68.1 percent of the comments indicate that the students started learning Japanese because they liked Japanese cultural products. From Doraemon to Utada Hikaru, I often heard the names of Japanese manga characters and idols when I asked the research informants and assistants what had motivated them to learn Japanese. I had already assumed that Japanese cultural products motivated Thai youths to start learning the Japanese language, and the questionnaire results supported this assumption. The purpose of the next question in the questionnaire was to ask about good experiences resulting from having acquired Japanese language ability: “Have you had any experiences that made you think Japanese language ability is an advantage or has benefits? If so, will you tell me about the incident(s)?” I wanted to know when and how the respondents thought the Japanese language would benefit their lives. I had already asked them about their motivations to start learning the language, and I wanted to know their opinions on learning Japanese. Therefore, I expected the replies to this question to be stories about incidents in which the respondents felt good about being able to speak Japanese. 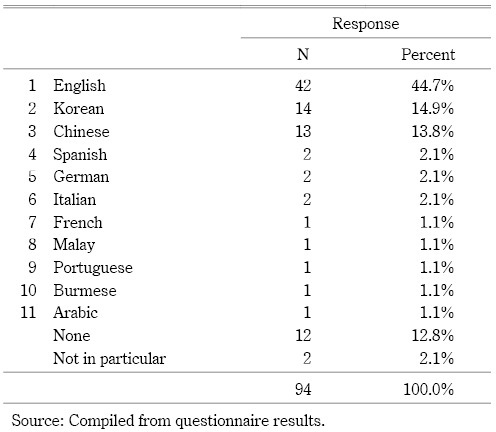 However, as shown in Table 8, many respondents wrote down their thoughts and opinions that had motivated them to start studying the language rather than specific incidents in their lives. 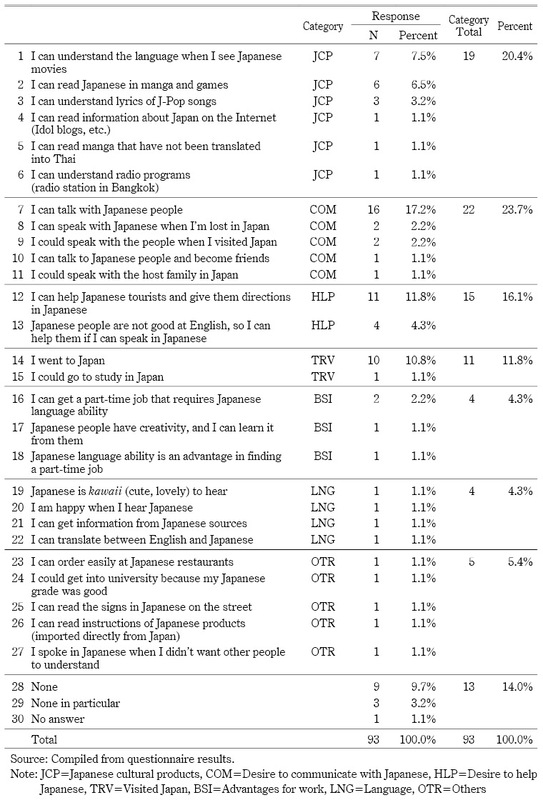 By grouping their answers, I found that 23.7 percent of the answers to the question fell into the category of “communication ability (COM),” which means that the ability to communicate in Japanese itself was a “good experience.” The fact that respondents could communicate with Japanese people in Japanese seems to have been an important experience for them. 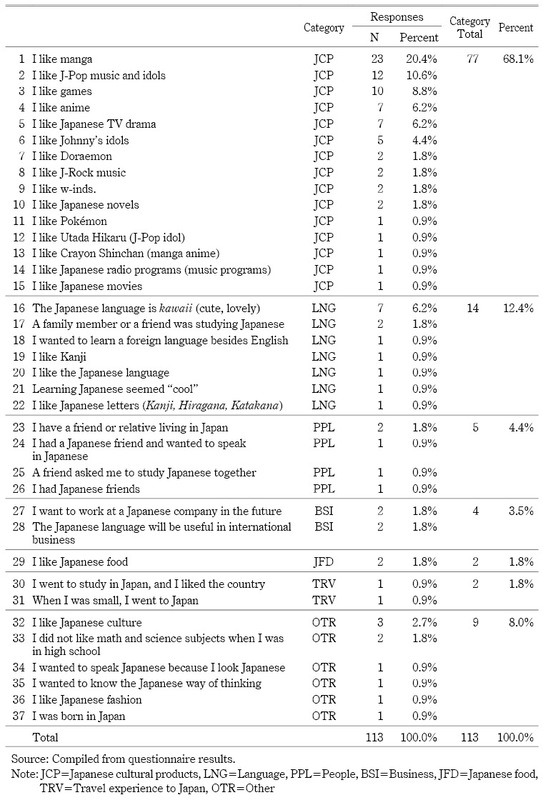 Contrary to my expectation, 20.4 percent of answers fell into the category of “Japanese cultural product consumption (JCP),” such as “I can read Japanese in manga and games,” “I can understand the lyrics of J-Pop songs,” and so on. At first, I was a little surprised to see this type of response, because “being able to read Japanese” is too obvious a response. I had expected to be told stories about personal incidents that related to the individuals. 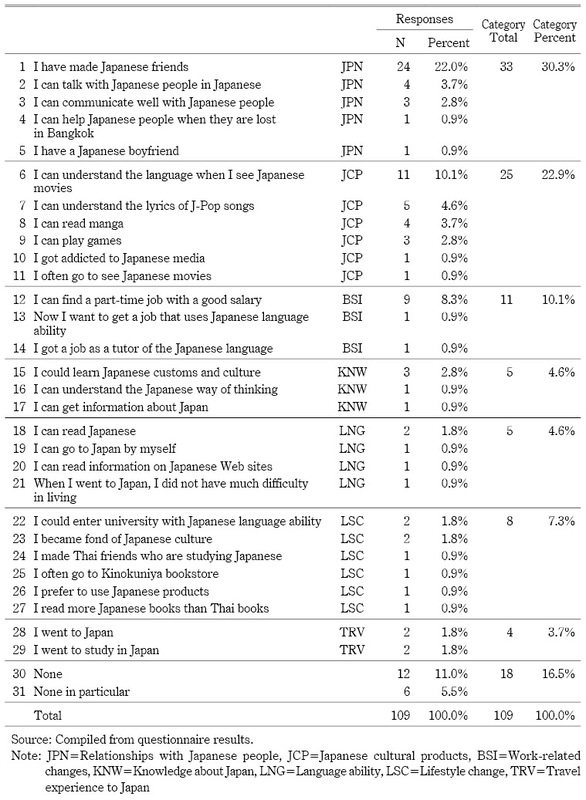 I also thought that the respondents who wrote other answers might have felt confident enough to be able to read Japanese manga or text in games, since for 68.1 percent of them the consumption of Japanese cultural products was the motivation to start learning the language in the first place. Consequently, I assumed that the respondents who wrote answers in the JCP category could not think of any incident that would fulfill the requirement of the question. Another category, which I did not expect to see but found interesting, was “desire to help Japanese people (HLP).” This category is closer to the previous category (COM) in terms of communication with Japanese people. However, the category HLP focuses on the altruistic attitude of respondents, while the category COM focuses on communication itself. When I read such answers as “I can help Japanese tourists and give them directions in Japanese” and “Japanese people are not good at English, so I can help them if I can speak in Japanese,” I remembered that Chulalongkorn University is located right next to Siam Square, which is the center of shopping and dining in Bangkok. Because there are many Japanese tourists visiting the area every day, I assumed that the students had helped Japanese tourists on the streets and that these encounters had become an important undertaking for them. There were other kinds of answers as well, which fell into the categories of “travel to Japan (TRV),” “advantage for work (BSI),” and “language (LNG).” In summary, I realized that many of the answers reflected the students’ motivation to continue learning the Japanese language. 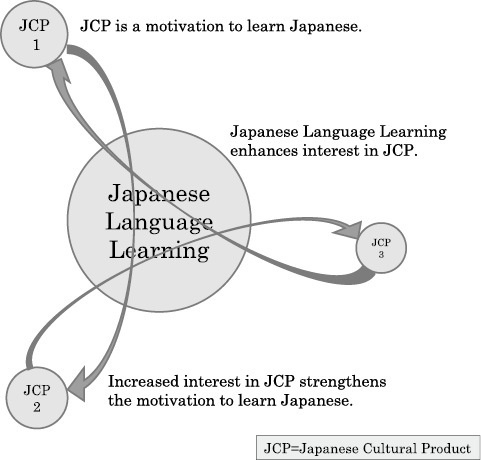 The category JCP may have been the initial incentive to begin learning the language for the majority of students, but as they continued learning they accumulated new experiences related to the language and some of them discovered an additional motivation to learn Japanese. In the next question, I asked whether the respondents were learning other foreign languages besides Japanese. The question inquired about the foreign language(s) that they were learning at the time of the questionnaire. So, if they were too busy learning Japanese, for instance, their answers might have been “none” or they might have left the space blank. In Table 9, the results show that English (44.7 percent) was the most popular foreign language. The second-most popular foreign language was Korean (14.9 percent), and the third was Chinese (13.8 percent). There were other foreign languages mentioned in the answers, but most of those languages had only a few learners. Also, a few students who liked to study foreign languages replied that they were studying more than two foreign languages besides Japanese—Arabic, Burmese, and so on. To demonstrate the attitudes of respondents toward foreign language studies, I also asked about the students’ reasons for studying foreign languages. The results have been compiled in Table 10. The reasons listed in Table 10 are for all the languages listed in Table 9. As I reviewed the answers, I noticed that many students who were studying English wrote reasons such as “for future work,” “to communicate with foreigners,” “as basic education,” and “useful.” In Thailand, English language education starts from the first grade in primary school as “preparatory English” class, and it continues throughout students’ basic education (Thailand, Ministry of Education 2008). In higher education, required subjects vary according to institutional curricula, but many students realize the importance of English as a lingua franca and continue learning it. The answer “I like K-Pop music” is obviously a reason to study Korean. As Korean idols have become popular in Thailand in recent years, the Korean language has been attracting people who like to consume Korean cultural products. On the other hand, respondents were learning Chinese “for future work,” because it was “useful,” and because they “want to learn many foreign languages,” all of which are reasons unrelated to Chinese cultural products. Table 11 contains a list of answers to the question “Has your life changed since you started to learn Japanese?” By asking this question, I aimed to find out whether the respondents’ lives had changed in terms of the consumption of Japanese cultural products and their relationships with Japan and Japanese people. The answers were grouped into seven categories: (1) relationships with Japanese people (JPN), (2) Japanese cultural products (JCP), (3) business-related changes (BSI), (4) knowledge about Japan (KNW), (5) language ability (LNG), (6) lifestyle change (LSC), and (7) travel experience to Japan (TRV). As we can see, 30.3 percent of answers were in the JPN category. The respondents thought their relationships with Japanese people had changed after they started learning Japanese. In fact, 24 respondents answered that they had made Japanese friends, and one student said she had got a Japanese boyfriend, which shows that Japanese people became closer and more accessible for them after they started learning the Japanese language. Another popular answer was “I can understand the language when I see Japanese movies,” which belongs in the JCP category. As we have already seen, 68.1 percent of answers in Table 7 indicated that the respondents started learning Japanese because they liked consuming Japanese cultural products. However, before they started learning the language, they consumed Japanese cultural products in their native Thai language. For the students, therefore, being able to watch Japanese movies in Japanese is an achievement that they attained and should be regarded as an important change. Answers in the BSI category, such as “I can find a part-time job with a good salary,” indicate the advantage of having Japanese language ability. The importance of Japanese language ability in searching for jobs is probably recognized by most of the respondents, since most graduates having a Japanese-language major will work in Japanese companies. According to surveys conducted at Thammasat University, among 500 graduates who obtained a degree with a Japanese-language major between 1986 and 2000, 81.6 percent secured jobs at Japanese companies; in 2007, 91.18 percent of graduates entered Japanese companies as translators, interpreters, secretaries, and so on (Somkiat 2008). Even before they graduate from university, Japanese-major students in Thailand know that Japanese language proficiency will be an advantage in obtaining a good job and receiving good remuneration. The other answers in the categories “knowledge about Japan” and “language ability” are also important in terms of the consumption of Japanese cultural products. Through the process of reading information about Japan in Japanese and accumulating knowledge about Japan with their Japanese language ability, the students will form a better understanding about Japan and its people, which will develop new interests in other Japanese cultural products and various places in Japan. In the next question, I listed 10 Japanese cultural products—(1) manga, (2) anime, (3) Japanese TV dramas, (4) Japanese TV variety programs, (5) J-Pop music, (6) Japanese idols, (7) Japanese games, (8) cosplay, (9) Japanese food, and (10) Japanese fashion—and asked respondents whether they liked the products “before” or “after” they started learning the Japanese language. The respondents could mark “Never” if they had never tried the product and “Don’t like” if they didn’t like the product at all. The results are compiled in Table 12. “Before” was marked most often in regard to Japanese cultural products except “cosplay,” which only 12 percent of respondents stated that they liked before they started learning Japanese. Even if we include the people who marked “after,” only 29 percent of respondents liked cosplay, which means it was the least popular among the 10 Japanese cultural products. Unlike other cultural products, cosplay is a participatory culture: people have to participate in manga and anime conventions. As cosplay is not something that can be consumed at home, the results seem to show the real popularity of cosplay. In regard to manga and anime, we can see that many of the respondents liked these products before they started learning Japanese. For manga, 82.1 percent answered they liked them before and only 6.4 percent answered they liked them after; for anime, 69.2 percent said “before” and only 9 percent said “after,” which means that 88.5 percent of respondents liked manga and 78.2 percent liked anime. Also, we have already seen that 92.3 percent of respondents started learning Japanese before they turned 17 years old (Table 6), and the results from Table 12 suggest that manga and anime were already popular among the respondents while they were attending secondary school. The questionnaire results for Japanese games appear to be similar to those for manga and anime, although games were not as popular as the other two products. A total of 62.8 percent of respondents replied that they liked games before they started learning Japanese and 9 percent started liking Japanese games after they began learning Japanese. A possible reason for Japanese games being less popular among secondary school students (compared to manga and anime) is the cost of game machines and software. While manga books are sold for about 40 baht on the streets, and Japanese anime can be watched on television for free, game machines such as the PlayStation 3 and Wii cost from several thousand baht to more than 10,000 baht (approximately US$200–300). Furthermore, in order to play games, it is necessary to connect game machines to television sets, and there may be times when parents do not allow their children to play games at home. Moreover, the table shows that 15.4 percent of respondents answered that they “don’t like” games, which may simply mean that games are less popular among Thai youths. In Table 12, it is also important to note that percentages of “after” as a response on the questionnaire for J-TV drama and J-TV variety programs were 38.5 percent and 39.7 percent respectively. The percentages demonstrate that many respondents started l­iking Japanese television programs after they started learning Japanese. As more than 40 percent of respondents liked Japanese TV dramas and variety programs before they started learning Japanese, Japanese TV programs could be enjoyed without any prior knowledge of the Japanese language. From these results, however, it seems that the respondents became more interested in Japan after they started learning Japanese, which made many of the respondents start watching Japanese television programs in order to see scenes of contemporary Japan and Japanese modern lifestyles in the dramas, and to find out the latest information about Japanese society and culture in variety programs. There is a close relationship between the cultural products J-Pop music and J-Idols. The category of “J-Idols” includes J-Pop music idols as well as young actors and actresses. On the other hand, when we say “J-Pop music,” the category includes music artists who are not called “idols” (as well as young singers who are “J-Pop Idols”). When it comes to J-Pop music, 55.1 percent of respondents answered that they liked J-Pop before they started learning Japanese and 17.9 percent said they liked it after they started learning Japanese. As for J-Idols, 39.7 percent of respondents said they liked them before they started learning Japanese, and 12.8 percent said they liked them after they started learning the language. These results suggest that respondents (17.9 percent in the case of J-Pop music and 12.8 percent in the case of J-Idol) may have been exposed to cultural products after they started learning Japanese and may have been influenced to like these products by other Japanese learners. Of the respondents, 85.9 percent appreciated Japanese food before they started learning Japanese and 11.5 percent liked it after Japanese language learning, which means that a total of 97.4 percent of respondents liked Japanese food. Just as in the case of manga, Japanese food has been accepted by the majority of Thai people, as evidenced by the large number of Japanese restaurants in Bangkok and the many supermarkets carry­ing Japanese food products that are served at Thai families’ dinner tables. The results indicate that most secondary school students in Thailand liked Japanese food before they began learning Japanese. Table 12 also reveals that Japanese fashion is less popular among secondary school students. Among the respondents, 44.9 percent answered that they liked Japanese fashion before they started learning Japanese, while 21.8 percent said they liked it after they started learning Japanese. The respondents who liked Japanese TV dramas, Japanese TV variety programs, J-Pop music, and J-Idols before they started learning Japanese might have been exposed to Japanese fashion before Japanese language learning. For the most part, Japanese fashion clothes may not be easy to obtain for secondary school students in Thailand, as they are sold only in certain boutiques and stores in the main cities and have limited availability in small towns and villages. The clothes are also more expensive in small towns and villages than local or casual clothes. Students of ­Chulalongkorn University, on the other hand, inevitably see Japanese fashion clothes every day because Siam Square, a shopping area located next to the university, is the center of J-Fashion in Bangkok. As a supplement to the previous question, I asked the respondents whether there was any Japanese cultural product that they became very interested in after they began learning the Japanese language. The results are shown in Table 13. Some respondents wrote more than two answers to the question. The most frequent answer to this question was “music.” When we think of Japanese cultural products with high percentages in the “After” column of Table 12, we might expect “TV dramas,” “TV variety programs,” “fashion,” and “music” to be higher in Table 13. The results show that music is the highest in percentage; however, the other three cultural products also became favorites after the respondents started to learn Japanese. As we have already seen, Japanese cuisine was popular among respondents even before they started learning the Japanese language. In order to see how much they would ordinarily consume Japanese food in their everyday lives as university students, I asked the question “How often do you eat Japanese dishes per month?” As shown in Fig. 4, the minimum was 0.5 times per month and the maximum was 20 times per month. The mode of the frequency distribution was 3 times per month, which was the response of 15 students; and the average frequency was 3.934 times per month, which means that respondents ate Japanese dishes approximately once a week. Considering the interrelatedness of Japanese cultural products and other factors about Japan, the classification into instrumental and integrative orientations seems too vague to be used in the analyses of the motivation of respondents in this study. Richard Clément and Bastian Kruidenier also point out the ambiguities in definitions of these orientations, as well as the influence of the social milieu, which causes variances in classification among scholars (Clément and Kruidenier 1983, 274–276). In their study to assess the influence of ethnicity, milieu, and target language on the emergence of orientations to second language acquisition, they suggested that four orientations are common to all second language student groups: (1) travel, (2) friendship, (3) knowledge, and (4) the instrumental orientations (ibid., 286). In this research, many of the respondents started to learn Japanese because they were motivated to consume Japanese cultural products. As they continued learning the language, then, they seemed to gain more motivation for learning the language, which may be classified in any of the four orientations. But since each individual had multiple reasons for their motivation to learn Japanese, it is not possible to classify a student’s motivation in a single orientation. Consumers of Japanese cultural products are always influenced by trends in Japanese pop culture, which may offer them a new motivation for learning Japanese. As theories of second language acquisition are focused mainly on classroom settings, they tend to overlook the complexities of the learners’ social milieu. Despite the ambiguity and difficulty in defining or classifying the various motivations of Japanese language learners, however, the discussions suggest that having a clear and strong motivation for learning a second language could well be an important factor in becoming a successful language learner. It is important to note that the respondents in this research were part of an elite in terms of Japanese language learning, since ­Chulalongkorn University is the highest-ranking university in Thailand and the Japanese language department admits only 35 students every year (Table 14). As we have seen in the study, many of the respondents started to learn Japanese because of their interest in Japanese cultural products and many of them became interested in further Japanese cultural products after they started to learn Japanese. This suggests that Japanese cultural products are not only a motivation to start learning Japanese but also a motivator to continue learning. Finding new Japanese cultural products of interest while they are learning Japanese, the students continuously have new sources of motivation to learn the language, which consequently leads them to be successful learners of the language. It is hoped that future research will attempt to prove such assumptions and assess the power of Japanese cultural products as a source of motivation in becoming a successful learner of the Japanese language. At the beginning of this study, I posed two hypotheses in order to try to disclose the relationship between the consumption of Japanese cultural products and Japanese language learning: (1) exposure to Japanese cultural products induces Japanese language learning, and (2) Japanese language learning induces the consumption of other Japanese cultural products. The first hypothesis has been tested, as we have already discussed at several junctures in this study, and the results in Table 7 prove that 68.1 percent of respondents started learning the Japanese language because of Japanese cultural products. 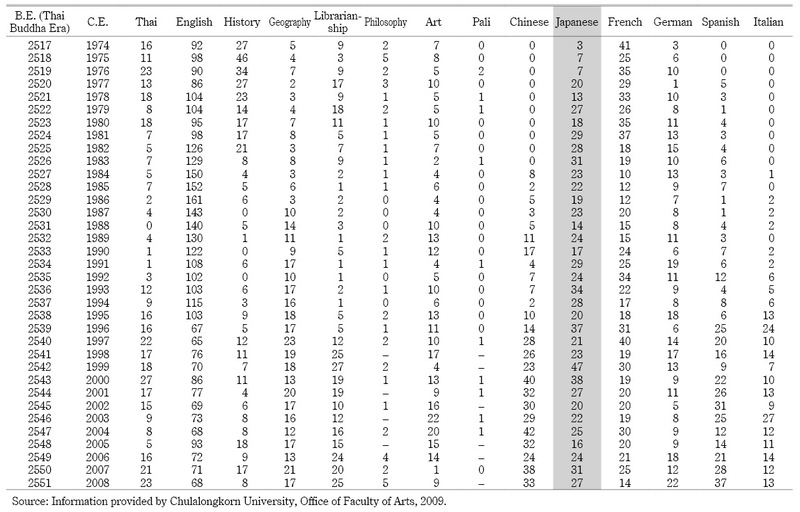 Tables 12 and 13 suggest that Japanese language learning may result in the consumption of Japanese cultural products, implying that there is an explanation underlying the second hypothesis. We have seen that all the Japanese cultural products listed in Table 12 have some respondents who started liking them “after” commencing Japanese language learning. Among the Japanese cultural products, TV dramas and TV variety programs gained a particularly large number of new fans after the respondents started learning Japanese, while J-Pop, J-Idol, cosplay, J-Food, and J-Fashion attracted some new consumers from among the respondents. 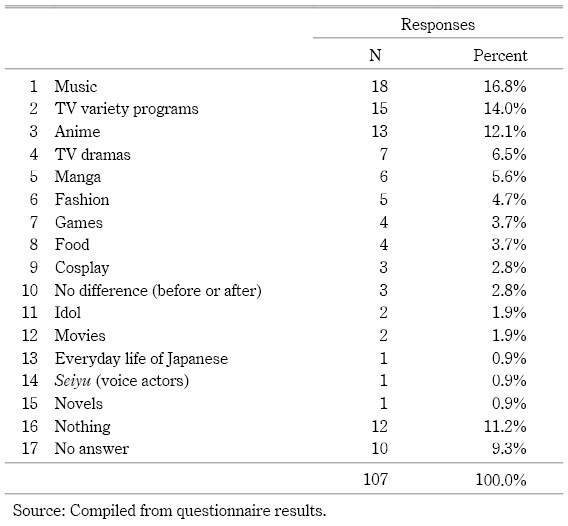 If we study Table 13 closely, we see that respondents tended to become more interested in music, TV variety programs, and anime after starting to learn Japanese. The results suggest that Japanese language learning reinforced the interest in Japanese cultural products that the respondents had before they started learning Japanese, and that increased their motivation to learn the language. Today, young Thai people are raised in an environment in which they are exposed to an abundance of Japanese culture. Cultural carriers, such as sojourners from Japan and Japanophiles in Thailand, increase Japan’s presence in Thailand and make Thai ­people more familiar with Japan. The cultural proximity, including the physical features and the imagery of Japan in the mass media, also makes Thai people think that Japan and Thailand have similarities in culture. Furthermore, the influx of Japanese culture through various channels such as media, products, or people reinforces a favorable attitude toward Japan. Encounters with, and the attraction of, Japanese cultural products in such an environment often motivate young Thais to start learning Japanese. In Thailand, there are numerous opportunities for young people to start learning the Japanese language. The fact that Japanese is one of the subjects in university entrance examinations in Thailand offers secondary school students a good reason to start learning Japanese, and the Japanese language education system in Thailand provides a good environment for students to learn the language. Then, while they are learning Japanese, they are exposed to new Japanese cultural products through Japanese teachers, school friends, and Japanese friends they make. As they discover new Japanese cultural products that they like, they are motivated to continue learning the Japanese language, which furnishes them with even more opportunities to encounter additional Japanese cultural products. The continuous cycle (of interests in learning the Japanese language and in consuming Japanese cultural products continuously enhancing each other) can be called the “virtuous cycle model” (Fig. 5). The cycle describes Thai youths’ experiences in consuming Japanese cultural products and learning Japanese in the present day. For example, when a student becomes interested in manga (JCP 1), the interest will be a motivation to learn the Japanese language. After the student starts to learn Japanese, he or she may become interested in J-Pop (JCP 2), which may motivate the student to learn the language with even greater enthusiasm. Later, as the student’s language ability improves, the student may in turn become interested in Japanese dramas and movies (JCP 3). The encounters with new Japanese cultural products become motivators for the student to continue learning the language, and they also enhance the student’s interest in Japan and its culture. It is important to note, however, that the sample in this research is a group of elite university students who are successful learners of Japanese. They may be leaders in the consumption of Japanese cultural products in Thailand, as the university is located in the center of Bangkok, where Japanese cultural products and Japanese culture can be found more easily than in the provincial areas of the country. It is hoped, therefore, that the cultural consumption model for other consumers of Japanese cultural products—those who have different backgrounds in terms of location and socioeconomic status—will be constructed in future studies. The notion of the “cultural discount” in media studies suggests that the value of Japanese cultural products could be diminished in Thailand, since Japan and Thailand are not in the same geolinguistic region. In this study, however, the values of Japanese cultural products do not seem to depreciate in Thailand; rather, they seem to be celebrated widely by Thai youths. Thus, the idea of “cultural discount” does not seem to work in the case of Japanese cultural products in Thailand, probably because there are no comparable quality cultural products among either domestic or other foreign products and also because of the cultural environment of the country. Although Japan and Thailand are not in the same geolinguistic region, young people in Thailand are familiar with Japanese youth culture thanks to the abundant exposure to Japanese cultural products in everyday life. The proliferation of Japanese cultural products in Thailand during the last few decades has led Thai people to feel comfortable and familiar with Japan and Japanese culture. For instance, today most Thai people start reading manga and watching anime in early childhood, and therefore manga and anime may not be perceived as foreign. I asked one of my informants (a university student), “Do Thai children have opportunities to see and get to know Japanese culture through manga and anime?” I was referring to scenes in anime, for example, where people take off their shoes at the entrance of houses and tatami mats are laid out on the floor. She replied, “Yes, I think they do. But they may not be conscious that they are seeing Japanese culture” (Personal communication, March 10, 2010). This suggests that Thai youths are exposed to Japanese culture subconsciously and that they learn about Japanese culture without realizing it, which would indicate the impreciseness of the argument that major Japanese cultural products are characterized as “culturally odorless” (Iwabuchi 2002, 94). Thai youths consume Japanese cultural products not because those products are “culturally odorless,” but because the “Japanese odor” does not feel foreign to them. In the discourse on the transnational consumption of television dramas, Ien Ang points to the important role of cultural proximity between two countries, rather than just arbitrary consumption by an audience (Ang 2003, 290). Ang points to the cultural proximity between Australia and the UK as a reason for the popularity of television dramas in both countries. In the global world, according to Ang, culture is not diffused homo­geneously but unevenly—sometimes overlapping, creating certain regions of trans­national cultural proximity and similarity (“transnational cultural zones”) (ibid. ; 2004, 305). The example of Australia and the UK is similar to the notion of the geolinguistic region, as these countries are both English speaking. However, if we put more emphasis on the common values in the cultures of different countries, Japan and Thailand have common values in terms of pop culture, subculture, and youth culture, which consequently places them in the same cultural zone. Despite the difference in the languages spoken and the geographical distance between the two countries, the youth culture of Thailand seems to have adopted many elements of Japanese youth culture; this forms the foundation for the continuous cycle of consumption of Japanese cultural products in Thailand. Lev Vygotsky’s notion of first language acquisition and the development of logic in a child can be applied to the discussion of second language acquisition, revealing a new layer of understanding about the culture of the second language and the consumption of cultural products. In fact, if we replace “Thought development” with “Understanding of another culture” in Vygotsky’s discussion, the above statement can point to the importance of language in understanding other cultures. Before a person starts to acquire a second language (as is the case with the first language), language acquisition and understanding of the other culture are entirely different processes. But after one begins learning a second language—at some point in the process of learning the language—language and thought start interacting. Through these interactions, then, language learning helps develop an understanding of the culture, and cultural understanding enhances learning of the second language. In an illustration of the relationship between language learning and an understanding of culture, a female student majoring in economics at Thammasat University once told me that while she was studying at Kyoto University as part of an exchange program, she learned that Japanese people use different “name honorifics” depending on the speaker’s relationship with other people. She also learned that these honorifics reflect the speaker’s respect toward the person (Personal communication, July 14, 2011). For example, the honorific sama is usually used to express respect toward a person, and it suggests that the speaker does not have a close relationship with that person. On the other hand, the honorific chan is used to address someone the speaker considers to be very close, and it also often expresses fondness or a feeling of affection toward the person. When the Thai student learned that there were different kinds of name honorifics in Japanese, she realized that when selecting the appropriate name honorific to use in each particular situation, Japanese people take into account the interpersonal relationship with the person. Furthermore, once the Thai student started to understand how Japanese people maintain social distance and manage interpersonal relationships with others, she began to understand which name honorific was required in each particular situation. To cite another example, a female student majoring in Japanese at Chulalongkorn University told me that she learned about the concept of uchi (meaning one’s home or one’s closest inner circle) and soto (meaning “others outside” or those who are outside uchi) in Japanese culture during the course of her language studies. She realized the importance of this concept when trying to understand the different forms in Japanese speech, such as the humble form (kenjogo), the honorific form (sonkeigo), and the polite form (teineigo) (Personal communication, January 23, 2012). The spatial distinction between uchi and soto may not be unique to Japanese culture, but Robert Sukle argues that the relationship between the distinction of uchi/soto and linguistic forms is found to exist in Japanese expressions (Sukle 1994). It is important to note that beyond the various linguistic discussions, the Thai student was able to learn the linguistic forms through practicing speaking Japanese and that she came to understand that a comprehension of the distinction of uchi/soto plays an important role in improving Japanese proficiency. As we can see in these examples, one key to successful language learning appears to be the synergistic effect of the interaction between language learning and an understanding of culture. In her explanation of the speech act in sociolinguistics theory, Nessa Wolfson points out that cultural definitions of speech—which are conditioned by the rules of the society that the speaker belongs to—are necessary in order to interpret the meaning of speech. In other words, the interpretation of cultural definitions is communicative competence in the language. In concluding this study, I can confirm that the discussions throughout this research have convinced me that many young Thai people who participated in my research developed an interest in Japanese culture and cultural products as they started learning the Japanese language, and that this learning enhanced their consumption of Japanese culture and cultural products. In the consumption of Japanese cultural products in Thailand, therefore, Japanese language learning is the gateway to the virtuous cycle of Japanese cultural product consumption. Ang, Ien イエン・アン. 2004. The Cultural Intimacy of TV Drama. In Feeling Asian Modernities: Transnational Consumption of Japanese TV Dramas, edited by Koichi Iwabuchi, pp. 303–309. Hong Kong: Hong Kong University Press. ―. 2003. Terebi Dorama ni Miru Bunkateki Shimmitsusei テレビドラマに見る文化的親密性 [Cultural proximity in television dramas]. In Gurobaru Purizumu: “Ajian Dorimu” toshiteno Nihon no Terebi Dorama グローバル・プリズム―〈アジアンドリーム〉としての日本のテレビドラマ [Global prism: Japanese TV drama as “Asian dream”], edited by Koichi Iwabuchi 岩渕功一, pp. 287–297. Tokyo: Heibonsha. Bussaba Banchongmanee ブッサバー・バンチョンマニー. 2004. Akiko to Tomodachi: Nihongo あきこと友だち―日本語 [Being friends with Akiko: Japanese]. Bangkok: Japan Foundation/Kinokuniya Bookstore. Bussaba Banchongmanee; Imaeda Aki; and Prapa Sangthongsuk ブッサバー・バンチョンマニー，今枝亜紀，プラパー・セーントーンスック. 2005. Tai no Chuto Kyoikuyo Nihongo Kyokasho Sakusei Purojekuto タイの中等教育用日本語教科書作成プロジェクト [The project of Japanese language textbook-making for Thai secondary education]. Kokusai Koryu Kikin Bankoku Nihon Bunka Senta Nihongo Kyoiku Kiyo 国際交流基金バンコク日本文化センター日本語教育紀要 [The journal of Japan Foundation Bangkok Japanese Language and Culture Center] 2: 147–158. Clément, Richard; and Kruidenier, Bastian G. 1983. Orientations in Second Language Acquisition 1: The Effects of Ethnicity, Milieu, and Target Language on Their Emergence. Language Learning 33(3): 273–291. Collins, Richard. 1990. Television, Policy and Culture. London: Unwin Hyman Ltd.
Ebihara Tomoharu 海老原智治. 2005. 2004 Nen no Tai Daigaku Nyushi to Nihongo o Juken Kamoku ni Shitei shita Daigaku Senko 2004年のタイ大学入試と日本語を受験科目に指定した大学専攻 [The 2004 university entrance examination and the university major programs that assigned Japanese language as a requirement]. Kokusai Koryu Kikin Bankoku Nihon Bunka Senta Nihongo Kyoiku Kiyo 国際交流基金バンコク日本文化センター日本語教育紀要 [The journal of Japan Foundation Bangkok Japanese Language and Culture Center] 2: 183–200. ―. 2004. Tai no Gakko Seidogai Kyoiku to Nihongo Kyoiku タイの学校制度外教育と日本語教育 [Non-formal education in Thailand and Japanese language education]. Kokusai Koryu Kikin Bankoku Nihon Bunka Senta Nihongo Kyoiku Kiyo 国際交流基金バンコク日本文化センター日本語教育紀要 [The journal of Japan Foundation Bangkok Japanese Language and Culture Center] 1: 201–216. Ek-Ariyasiri, Eknarint エックナリン・エックアリヤスィリ. 2008. Tai Koto Kyoiku Kikan no Nihongo Senko Karikyuramu Kaihatsu ni Kansuru Kenkyu: Purinsu obu Sonkura Daigaku o Rei ni タイ高等教育機関の日本語専攻カリキュラム開発に関する研究―プリンス・オブ・ソンクラー大学を例に [Study on curriculum development of Japanese as a major in higher education in Thailand: A case study of Prince of Songkla University]. Nihon Gengo Bunka Kenkyukai Ronshu 日本言語文化研究会論集 [Journal of Japanese language and culture] 4: 117–144. Gardner, Richard C.; and Lambert, Wallace E. 1972. Attitudes and Motivation in Second-Language Learning. Rowley, MA: Newbury House Publishers. Hoskins, Colin; and Mirus, Rolf. 1988. Reasons for the US Dominance of the International Trade in Television Programmes. Media, Culture and Society 10: 499–515. Iwabuchi, Koichi. 2002. Recentering Globalization: Popular Culture and Japanese Transnationalism. Durham: Duke University Press. Japan, Japan Foundation 国際交流基金. 2009. Nihongo Noryoku Shiken Kekka no Gaiyo 2008 日本語能力試験結果の概要2008 [The Japanese-Language Proficiency Test summary of the results 2008]. Tokyo: Japan Foundation. ―. 2008a. Kaigai no Nihongo Kyoiku no Genjo 2006 Nen 海外の日本語教育の現状2006年 [Survey report on Japanese-language education abroad 2006]. Tokyo: Japan Foundation. ―. 2008b. Nihongo Noryoku Shiken Kekka no Gaiyo 2007 日本語能力試験結果の概要2007 [The Japanese-Language Proficiency Test summary of the results 2007]. Tokyo: Japan Foundation. ―. 2007. Nihongo Noryoku Shiken Kekka no Gaiyo 2006 日本語能力試験結果の概要2006 [The Japanese-Language Proficiency Test summary of the results 2006]. Tokyo: Japan Foundation. ―. 2006. Nihongo Noryoku Shiken Kekka no Gaiyo 2005 日本語能力試験結果の概要2005 [The Japanese-Language Proficiency Test summary of the results 2005]. Tokyo: Japan Foundation. ―. 2005. Nihongo Noryoku Shiken Kekka no Gaiyo 2004 日本語能力試験結果の概要2004 [The Japanese-Language Proficiency Test summary of the results 2004]. Tokyo: Japan Foundation. ―. 2004. Nihongo Noryoku Shiken Kekka no Gaiyo 2003 日本語能力試験結果の概要2003 [The Japanese-Language Proficiency Test summary of the results 2003]. Tokyo: Japan Foundation. ―. 2003. Nihongo Noryoku Shiken Kekka no Gaiyo 2002 日本語能力試験結果の概要2002 [The Japanese-Language Proficiency Test summary of the results 2002]. Tokyo: Japan Foundation. ―. 2002. Nihongo Noryoku Shiken Kekka no Gaiyo 2001 日本語能力試験結果の概要2001 [The Japanese-Language Proficiency Test summary of the results 2001]. Tokyo: Japan Foundation. ―. 2001. Nihongo Noryoku Shiken Kekka no Gaiyo 2000 日本語能力試験結果の概要2000 [The Japanese-Language Proficiency Test summary of the results 2000]. Tokyo: Japan Foundation. ―. 2000. Nihongo Noryoku Shiken Kekka no Gaiyo 1999 日本語能力試験結果の概要1999 [The Japanese-Language Proficiency Test summary of the results 1999]. Tokyo: Japan Foundation. ―. 1999. Nihongo Noryoku Shiken Kekka no Gaiyo 1998 日本語能力試験結果の概要1998 [The Japanese-Language Proficiency Test summary of the results 1998]. Tokyo: Japan Foundation. ―. 1998. Nihongo Noryoku Shiken Kekka no Gaiyo 1997 日本語能力試験結果の概要1997 [The Japanese-Language Proficiency Test summary of the results 1997]. Tokyo: Japan Foundation. ―. 1997. Nihongo Noryoku Shiken Kekka no Gaiyo 1996 日本語能力試験結果の概要1996 [The Japanese-Language Proficiency Test summary of the results 1996]. Tokyo: Japan Foundation. ―. 1996. Nihongo Noryoku Shiken Kekka no Gaiyo 1995 日本語能力試験結果の概要1995 [The Japanese-Language Proficiency Test summary of the results 1995]. Tokyo: Japan Foundation. ―. 1995. Nihongo Noryoku Shiken Kekka no Gaiyo 1994 日本語能力試験結果の概要1994 [The Japanese-Language Proficiency Test summary of the results 1994]. Tokyo: Japan Foundation. ―. 1994. Nihongo Noryoku Shiken Kekka no Gaiyo 1993 日本語能力試験結果の概要1993 [The Japanese-Language Proficiency Test summary of the results 1993]. Tokyo: Japan Foundation. ―. 1993. Nihongo Noryoku Shiken Kekka no Gaiyo 1992 日本語能力試験結果の概要1992 [The Japanese-Language Proficiency Test summary of the results 1992]. Tokyo: Japan Foundation. ―. 1992. Nihongo Noryoku Shiken Kekka no Gaiyo 1991 日本語能力試験結果の概要1991 [The Japanese-Language Proficiency Test summary of the results 1991]. Tokyo: Japan Foundation. ―. 1991. Nihongo Noryoku Shiken Kekka no Gaiyo 1990 日本語能力試験結果の概要1990 [The Japanese-Language Proficiency Test summary of the results 1990]. Tokyo: Japan Foundation. ―. 1990. Nihongo Noryoku Shiken Kekka no Gaiyo 1989 日本語能力試験結果の概要1989 [The Japanese-Language Proficiency Test summary of the results 1989]. Tokyo: Japan Foundation. ―. 1989. Nihongo Noryoku Shiken Kekka no Gaiyo 1988 日本語能力試験結果の概要1988 [The Japanese-Language Proficiency Test summary of the results 1988]. Tokyo: Japan Foundation. ―. 1988. Nihongo Noryoku Shiken Kekka no Gaiyo 1987 日本語能力試験結果の概要1987 [The Japanese-Language Proficiency Test summary of the results 1987]. Tokyo: Japan Foundation. ―. 1987. Nihongo Noryoku Shiken Kekka no Gaiyo 1986 日本語能力試験結果の概要1986 [The Japanese-Language Proficiency Test summary of the results 1986]. Tokyo: Japan Foundation. ―. 1986. Nihongo Noryoku Shiken Kekka no Gaiyo 1985 日本語能力試験結果の概要1985 [The Japanese-Language Proficiency Test summary of the results 1985]. Tokyo: Japan Foundation. ―. 1985. Nihongo Noryoku Shiken Kekka no Gaiyo 1984 日本語能力試験結果の概要1984 [The Japanese-Language Proficiency Test summary of the results 1984]. Tokyo: Japan Foundation. Koh, Barbara. 1999. Society & the Arts: Cute Power! Newsweek November 8: 40–45. Lee, Francis L. 2006. Cultural Discount and Cross-culture Predictability: Examining the Box Office Performance of American Movies in Hong Kong. Journal of Media Economics 19(4): 259–278. Matsui Yoshikazu; Kitamura Takeshi; and Voravudhi Chirasombutti 松井嘉和，北村武士，ウォラウット・チラソンバット. 1999. Tai ni okeru Nihongo Kyoiku: Sono Kiban to Seisei to Hatten タイにおける日本語教育―その基盤と生成と発展 [Japanese language education in Thailand: Its background, situations and a history of its development]. Tokyo: Kinseisha. Natnicha Vadhannapanich ณัฐณิชา วัฒนพานิช. 2010. Kaan Perd Rap Wattanatam Pop Yipun Khong Wayrunthai Phaan SuuMuanChon Le ReangJungJai Nai KaanRian Phaasaa Yipun การเปิดรับวัฒนธรรมป๊อปญี่ปุ่นของวัยรุ่นไทยผ่านสื่อมวลชนและแรงจูงใจในการเรียนภาษาญี่ปุ่น [Teenagers’ exposure to Japanese popular culture in mass media and the motivation to study Japanese language]. Master’s thesis, Chulalongkorn University, Bangkok (Mimeographed). Noels, Kimberly A.; Pelletier, Luc G.; Clément, Richard; and Vallerand, Robert J. 2000. Why Are You Learning a Second Language? Motivation Orientations and Self-Determination Theory. Language Learning 50(1): 57–85. Shiratori Fumiko 白鳥文子. 2002. Chuto Kyoiku Katei Koki no Sentaku Jiyu Kamoku ni okeru Gakushu Naiyo 中等教育課程後期の選択自由科目における学習内容 [Curriculum content in elective subjects in upper secondary education]. Kokusai Koryu Kikin Bankokku Nihongo Senta Kiyo 国際交流基金バンコック日本語センター紀要 [Journal of the Japan Foundation Bangkok Japanese Language Center] 5: 191–195. Sinclair, John. 1996. Culture and Trade: Some Theoretical and Practical Considerations. In Mass Media and Free Trade: NAFTA and the Cultural Industries, edited by Emile G. McAnany and Kenton T. Wilkinson, pp. 30–60. Austin: University of Texas Press. Somkiat Chawengkijwanich ソムキアット・チャウェンギッジワニット. 2008. Tamasato Daigaku ni okeru Nihongo Kyoiku no Genjo oyobi Kongo no Kadai タマサート大学における日本語教育の現状および今後の課題 [The present status of Japanese language education and future themes at Thammasat University]. Nihongo, Nihon Bunka Tai-Nichi Kokusai Shimpojiumu: Kenkyusha, Kodo Shokugyojin Ikusei ni okeru Nihongo Kyoiku no Yakuwari 日本語・日本文化タイ日国際シンポジウム―研究者・高度職業人育成における日本語教育の役割 [Japanese language, Japanese culture: Thai-Japan international symposium: The role of Japanese language education in educating scholars and skilled professional]. Osaka: Center for Japanese Language and Culture, Osaka University. Sukle, Robert J. 1994. Uchi/Soto: Choices in Directive Speech Acts in Japanese. In Situated Meaning: Inside and Outside in Japanese Self, Society, and Language, edited by Jane M. Bachnik and Charles J. Quinn, pp. 113–142. Princeton: Princeton University Press. Thailand, Ministry of Education. 2008. The Basic Education Core Curriculum B.E. 2551 (A.D. 2008). Bangkok: Ministry of Education, Thailand. ―. 2001. Basic Education Curriculum B.E. 2544 (A.D. 2001). Bangkok: Ministry of Education, Thailand. Thailand, Office of the Education Council. 2004. Education in Thailand 2004. Bangkok: Ministry of Education, Thailand. Toyoshima, Noboru. 2011. Consuming Japan: The Consumption of Japanese Cultural Products in Thailand. Tokyo: Waseda University Press. United Nations, Department of Economic and Social Affairs (DESA). 2009. World Population Prospects: The 2008 Revision, Vol. 2. Vygotsky, Lev. 1986. Thought and Language. Cambridge: MIT Press. Wolfson, Nessa. 1989. Perspectives: Sociolinguistics and TESOL. Boston: Heinle & Heinle Publishers.